The use of square copper surface area than the same load area of the circular conductor, the skin effect of small principles, the high-frequency signal presented by the low impedance, theoretically can know the high purity square copper high frequency signal loss Micro, which makes the treble more clear and clean. 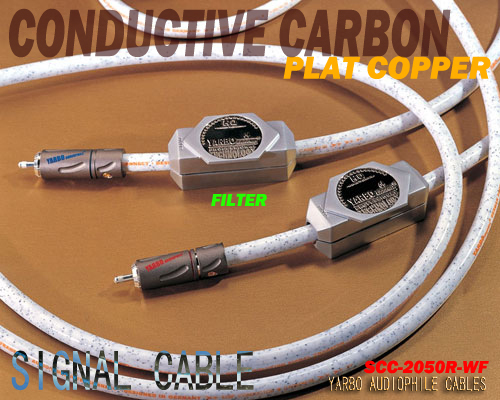 As the square core copper conductor transmission area is widened and enlarged, the signal transmission is more smooth, can greatly enhance the audio resolution, transient, dynamic response more in place synchronization, reduce distortion and loss of sound, so sound field more detailed, active, three The Conductor surface is closely coated with black conductive carbon PE material and the conductor will constitute an excellent conduction effect, and carbon itself has ultra-high frequency filter characteristics, the effective absorption of noise, eliminate noise interference within the power, so that the treble performance more open , Restore more details. (Internal black conductive carbon PE material) excellent physical and chemical properties, can effectively resist the distortion, anti-air pollution and oxidation to prevent the decay of the course of time, to maintain the best long-term state. Equipped with imported original precision, superconducting, lockable, the main plated thick silver RCA, and with a unique protruding floating point of the unique stylus terminal, its signal transmission characteristics better and more stable. Internal filled closed transparent adhesive, can effectively prevent the oxidation of the conductor, so as to ensure long-term use of audio transmission stability. In the input end of the assembly of powerful metal filter box, can effectively eliminate all kinds of high-frequency electromagnetic interference, can make the music background pure and noisy, sound more sweet, transparent, natural, noble. All welding points are made of German WBT silver tin professional welding, quality assurance. Counterfeit products RCA terminal head is also similar to a small garden point, the internal solder joints are not bright and full of specifications, and rough process, poor plating effect, the use of poor quality copper wire, the transmission loss in the great. For the fight against fake and imitation of the Jabo wire and the terminal, <YARBO AUDIOPHILE> Jabul full range of the original product, has been in June 1, 2006 the beginning of the full use of green genuine logo and packaging seals, fans can buy on the spot Telephone, mobile phone text messages and the Internet three ways to check the authenticity of self-help <at the bottom of the company's profile at the bottom left there is a real check bar for enthusiasts self-help verification. > At the same time in the purchase also need to pay attention to the original color seal seal intact to ensure genuine licensed, was the quality of the company's guarantee and after-sales service.